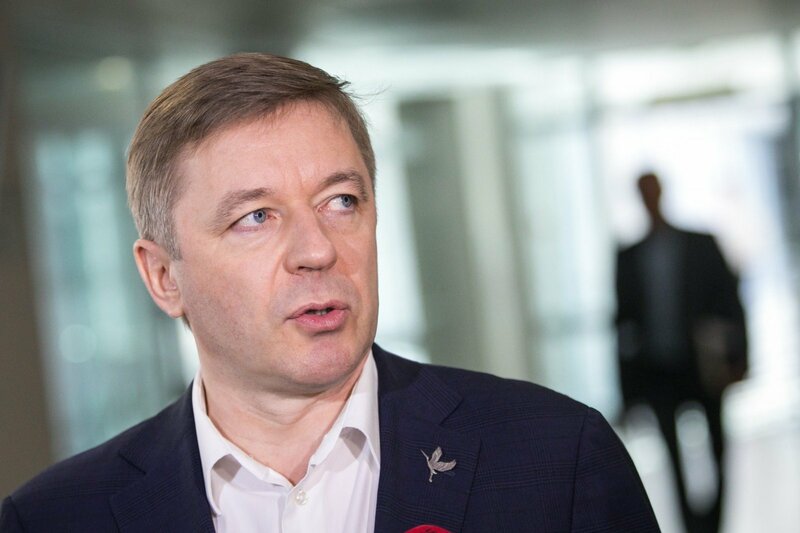 Individuals delegated by "Farmer" leader Ramūnas Karbauskis' family business Agrokoncernas, according to what the LRT Investigation Department uncovered, are acting like at home in a state enterprise. With the "Farmers" entering power, talks have once more resumed about the privatisation of the Jonavos Grūdai, which maintains the state grain reserve. There were earlier plans to privatise the company. These failed, however more individuals entered company management, who are favourable to R. Karbauskis, including independent members, who belong to specifically the "Farmer" party. Jonavos Grūdai began to offer new services – offering Agrokoncernas fertiliser on loan based on promisory notes. Data gathered by the LRT Investigation Department shows that the state owned enterprise, which is important to national security, is gradually being taken over by Agrokoncernas. Jonavos Grūdai is not just any state owned company. By law, it is specified as holding strategic importance to national security. The company purchases grain from farmers, cleans, dries and later sells it. Jonava also is home to one of the largest grain elevators in the country – a building, where grain can be held for an especially long time. The warehouses of Jonavos Grūdai hold the state grain reserve, also stores of other foods, sugar and salt. They would be needed in case of war or another major accident. Information on such a reserve is classified, also the company's annual funding for assembling the reserve and maintaining it. However, this company, which is especially important to national security, is not only managed by the state, but also by R. Karbauskis' family business. More precisely by Agrokoncerno Grūdai, which is owned by specifically R. Karbauskis. Jonavos Grūdai has a total of 103 shareholders. 70.13% of the stock is state owned, while 25.08% - by Agrokoncerno Grūdai. The remaining 101 are minor stockholders, who own just 4.79% of the stock. The state grain purchase company is headed by Paulius Kaselis, who admits to being a farmer himself and growing grain. However, according to the director, there is no conflict of interests because he has not taken grain to the Jonavos Grūdai grain elevator. P. Kaselis assures that only two hectares of his farm's five are used for grain. All the grain is then used for farm uses. "For our own use – rabbits, sheep, everything for the family. I have not taken it to any elevator, only for our own use. Growing grain is a hobby," he says. While the state is the founder of Jonavos Grūdai and its main shareholder, Agrokoncernas is no less an owner of it. The state owned enterprise, whose priority should be maintaining reserves is dealing in business and to s great degree services R. Karbauskis' family business. In reports, Jonavos Grūdai itself admits that their largest client is namely Agrokoncerno Grūdai. The "Farmer" leader's grain purchasing company is storing its grain and fertilisers at Jonavos Grūdai warehouses. It pays for these services and thus it is all legal. Fertiliser was not always kept at the state owned enterprise warehouses. This activity, according to the heads of Jonavos Grūdai was initiated by the company in only 2016. The contract was made with a different company back then, not Agrokoncerno Grūdai. In 2017, Jonavos Grūdai ended the contract with their earlier partners and made an agreement with the "Farmer" leader's family business. Jonavos Grūdai assures that the contract with Agrokoncerno Grūdai was more profitable for them – the latter company paid more. "We worked with that other supplier. Their work capacities were not satisfactory because a small leftover of fertiliser was being held. We received little income from that activity since there was little assurance, no plans, how much they will store. Income from that service was not developing, we started seeking other potential buyers. Today, we are working with Agrokoncernas," Jonavos Grūdai Commerce and Innovations Department head Mantas Butas explains. During a year, 1400 tonnes of Agrokoncernas grain has been loaded at Jonavos Grūdai. However, Jonavos Grūdai not only warehouses fertiliser, but also retails it. Last year, Jonavos Grūdai earned 160 thousand euro from fertiliser sales and 3040 euro for pesticide sales. Agrokoncernas itself assures that Jonavos Grūdai obtained 774 tonnes of fertiliser from them. Jonavos Grūdai states that they do not have any pre-contracts with suppliers regarding fertiliser. Apparently there are three main ones, however most of the retailed fertiliser right now stems from Agrokoncernas. The scheme is simple: the farmer brings grain to the state owned enterprise and can immediately load up some fertiliser. For example, that of Agrokoncernas. Deals with Agrokoncernas and other companies are not made through public procurements. In other terms, the state owned enterprise can purchase from whomever and for however much, the sums are left confidential. Jonavos Grūdai is not the purchasing organisation. It has the status of supplier. Why the state owned enterprise is not beholden to the public procurement law despite starting to deal in fertiliser and pesticide trade, its head and board chairman struggle to explain. "Jurists explained everything to us. We are a joint stock company, we have approved our internal purchasing regulations and are operating based on them," P. Kaselis assured. "From what I know of the practice, as it was, they choose from three suppliers, based on the lowest price. Internal purchase regulations have been set. As for the purchasing organisation status, I believe I will pose this question as board chairman in the nearest board meeting. We will discuss this question. And certainly, so that it would be more transparent, suitable and effective, I believe we will change the necessary legal acts and will call upon Jonavos Grūdai." Farmers can also obtain Jonavos Grūdai fertilisers on loan as well. The enterprise has begun dealing in a new service – credit for services. A promissory note is signed by the farmer for the fertiliser being provided. The use of promissory notes in agriculture has been questioned by the Seimas opposition, which also initiated and investigatory commission. Doubts on promissory notes arose when it turned out that large companies drag smaller companies and farmers into debt through promissory notes and later take their lands. Jonavos Grūdai assures that so far in their practice, there have been no cases of massively indebted for fertiliser farmers. Everyone, who used the opportunity to obtain fertiliser from the state owned company, paid for it in due time. Based on its stock share, Agrokoncerno Grūdai holds just one place in the Jonavos Grūdai board. This place is currently held by Agrokoncerno Grūdai head of purchases Tomas Urbonas. However, with the "Farmers" coming into power, the number of delegates from the Ministry of Agriculture has begun declining. Currently, the Jonavos Grūdai board is comprised of five members, a sixth is being sought. Of the five members, two are delegated by the Ministry of Agriculture. Just last year, this number was four. The ministry assures it seeks to appoint independent board members, thus seeking to depoliticise the company's management. However, here's a specific example of how the management of Jonavos Grūdai is being depoliticised – Audrius Zalatoris appears in the board as an independent, while also belonging to a political party – the LVŽS. "It is specified even in the Constitution itself that you cannot discriminate individuals based on political party, race or nationality," Jonavos Grūdai board chairman J. Kornijenko explains. Thus, when resolving the matters of the state owned company, R. Karbauskis has taken the upper hand – the Jonavos Grūdai board is comprised of representatives of the "Farmer" held Ministry of Agriculture, Agrokoncerno Grūdai and the "Farmer" party. On April 1 this year, Jonavos Grūdai granted an exclusive boon on the Agrokoncerno Grūdai delegated board member T. Urbonas. The shareholder meeting agreed that he would be granted a 1600 euro wage for his work at the board last year. The Ministry of Agriculture delegate was directed to vote in favour of the wage by none other than the then "Farmer" minister Bronius Markauskas. The other independent board members have not been assigned wages as of yet. It is curious that R. Karbauskis, who has interests in Jonavos Grūdai, earlier fiercely opposed the company being led by individuals linked to politicians. For example, when the 2013 Ministry of Agriculture management decided to change the enterprise's head, R. Karbauskis told Verslo Žinios, "If it turns out that the new head is politically affiliated with the new government, I intend to take the matter to the court over a breach of my rights as a shareholder." R. Karbauskis' business began purchasing the shares of Jonavos Grūdai in 2002. Back then, when the Ministry of Agriculture was led by an agronomist, the New Union's (later merged with the Labour Party) Jeronimas Kraujelis. He assures that the strategic stat importance enterprise's shares were opened for purchase in order to involve minor grain farmers in its management, so that they would become a counterbalance to major farmers, who dictated grain purchase prices. Ones like Agrokoncernas. "The plan was that farmers and agricultural companies, legal entities, whose income from agriculture was no less than 50% would come. These entities, which bought out farms and companies, they were not prominent in my time," J. Kraujelis recalls. "Jonavos Grūdai shares were provided to farmers, who took their grain to the elevator. Shares were also distributed to employees. Later, Agrokoncerno Grūdai would buy the minor shareholders' stocks. In 2002, when J. Kraujelis led the ministry, Agrokoncernas had already obtained 16.45% of Jonavos Grūdai shares. When the "Farmers" came to power and Kazimiera Prunskienė became minister of agriculture, R. Karbauskis' business began to purchase ever more shares. In 2004, Agrokoncerno Grūdai already had 19.8% of the state owned enterprise's shares, in 2005 – 20.15%, 2006 – 23.93%, 2008 - - 24.54%, 2009 – 24.85%. Agrokoncernas itself states that they cannot specifically outline, which part of the shares were purchased from farmers and which – from Jonavos Grūdai employees. Under K. Prunskienė's leadership, talks surfaced about the privatisation of this strategic importance company. That said, R. Karbauskis assured he had never pursued such plans, but other witnesses of the time tell a different tale. On the March 26 – April 2, 2010 publication of Gimtasis Kraštas, former Prime Minister K. Prunskienė is quoted as saying, "I knew what interests he harbours, but they could not be reasonably satisfied." When asked, whether R. Karbauskis sought to privatise Jonavos Grūdai, K. Prunskienė did not deny it: "The question should be different – how many times?" Unofficially there are talks that the paths of "Farmer" leader K. Prunskienė and R. Karbauskis separated. R. Karbauskis withdrew from the then "Farmer" party and the post of its vice chairman in 2008. In public, he claimed it was in protest against the then party leader K. Prunskienė's "lack of democracy." With the end of K. Prunskienė's term and conservative Kazys Starkevičius, also a farmer, taking charge of the Ministry of Agriculture, the struggle over Jonavos Grūdai continued. "When I was minister, there were aims of private capital investing (in Jonavos Grūdai). The portion would have increased even further, in such a case the group would have already had the full share package," former Minister of Agriculture K. Starkevičius explains. At that time, R. Karbauskis levied accusations of seeking to take over Jonavos Grūdai at specifically K. Starkevičius and his deputy, vice minister Aušrys Macijauskas (earlier the head of the Lithuanian Grain Growers' Association, now its chair once again). R. Karbauskis claimed that the ministry seeks to usurp the farmers' company and expressed outrage when it was decided to delegate another representative from the Ministry of Agriculture the observer board, removing the minor shareholders' representative Vykintas Česlovas Jakštas. V. Č. Jakštas belonged to none other than the "Farmer" party. "The Ministry of Agriculture's aim to rule Jonavos Grūdai from the offices of the ministry is incomprehensible. After all, officials cannot manage a production object, that is to say – a company," R. Karbauskis said back then. The "Farmer" leader threatened legal action and they would represent both the state's and their own interests as shareholders. Former Vice Minister of Agriculture A. Macijauskas explains as follows, "The decision was very logical because the observer board, despite having over 70% of the shares, did not have a suitable number of representatives. And decisions were usually made that may not have been the most beneficial to the state. The Ministry of Agriculture saw that the state can obtain more benefit from the elevator. It demanded it from the company. Due to this, it was aimed to increase the number of representatives in the observer board. So that the state would receive as much benefit as possible in the shape of dividends. Meanwhile, business interests, not necessarily those of Agrokoncernas, but also other business interests, were somewhat opposite. They wanted to make use of this company's services at the lowest costs possible." This would have meant that in Jonavos Grūdai, Agrokoncerno Grūdai and other companies would have been able to warehouse grain, fertiliser and plant protection measures cheaper. They could also use grain drying and cleaning services cheaper. Now that R. Karbauskis is in power again, even more curious matters have started in the company. The "Farmers", who harbour plans of state owned pharmacies and alcohol stores, want to relinquish activities in other spheres, which perform functions, which apparently are not within state remit. Coincidence or not, but among such activities, we also find those performed by Jonavos Grūdai, the same company R. Karbauskis has been aiming at for years. Minister of Agriculture Giedrius Surplys assures that Jonavos Grūdai should be privatised. "The state shouldn't deal in business. The long-term vision is such. Speaking of Jonavos Grūdai specifically, this company has special functions. Currently it holds our grain reserve and it performs grain warehousing, which is purchased based on EU rules as intervention. While this company has these special functions, it remains untouchable. When we strip those functions, we can then talk about privatising the company by way of auction," the minister explains. G. Surplys assures that the company could be privatised in a few years, while the state grain reserve could be secured in the grain stores of private companies. When asked if this means that Agrokoncerno Grūdai could take over Jonavos Grūdai, G. Surplys assures, "Not necessarily. An auction would be held, whoever offered the largest price for the stock in the auction would become the owner of the company." R. Karbauskis himself does not comment such plans – supposedly, he has recused himself from business questions. However, R. Karbauskis representative Dalia Vencevičienė rushed to pass on to the LRT Investigation Department that minister G. Surplys... was mistaken. Apparently, the cabinet has no plans to privatise Jonavos Grūdai. On being put on sale, Jonavos Grūdai could become an especially appealing commodity. The grain elevator is in a most favourable position geographically – in central Lithuania. It was modernised for EU funding. Furthermore, Ukmergė also holds a modern grain and rapeseed collection and purchase point. Jonavos Grūdai is also useful to Agrokoncerno Grūdai due to competition. Right next to the state owned enterprise, one of R. Karbauskis' main competitors Tautvydas Barštys' business Kauno Grūdai has its warehouse right next to the state owned enterprise. Furthermore, Jonavos Grūdai is a profitable company. In 2016, the company's profits were 655,922 euro, in 2017 – 940,367 euro. Part of the profits from the state owned enterprise also go to R. Karbauskis' business. Last year, Agrokoncerno Grūdai was paid 184,434 euro in dividends. It is not without reason that it is said that Lithuania's gold is in fields of grain. What could R. Karbauskis and Agrokoncernas' interests be in a company where they hold a quarter of the shares and receive a few hundred thousand in dividends every year, when his own business generates millions? The state buys grain for the state grain reserve every year, spending millions. From where and for how much such grain is sold is a state secret. However, past details reveal much. In 2011, the Vilnius office of Transparency International revealed that in late 2006, during K. Prunskienė's term as minister, the Ministry of Agriculture purchased grain for the reserve from Agrokoncerno Grūdai. For this, R. Karbauskis' business received 4.88 million litas (1.41 million euro). Where and for how much grain is purchased to the state reserve now, the Ministry of Agriculture cannot answer. They repeat, it is a state secret. Minister G. Surplys is in no rush to dispel doubts either. He assures that he can neither confirm, not deny that grain for the state reserve is now not purchased from Agrokoncernas. "I can neither confirm, nor deny. The company has its own management, its own board, which also includes private individuals, a representative from Agrokoncernas, two from the Ministry of Agriculture, perhaps you should ask them. To my knowledge, all those competitions are held transparently. Whoever we buy the grain from is who we buy from," the minister, who also belongs to the "Farmer" party says. Jonavos Grūdai is the only remaining state owned grain purchase company, which has an elevator. However, back in the Soviet era and following independence, there were more state owned grain purchasers. Later on, using EU funding, agricultural cooperatives also constructed grain elevators. Gradually, major businesses took over farmer held grain elevators. In total, there are up to several tens of companies, which own elevators in the country. These would be the companies of Agrokoncerno Grupė, Linas Agro, Scandagra, Agrochema and Kauno Grūdai. Agrokoncernas explains that they own 6 elevators, however if agricultural companies belonging to the group are to be included, the number could rise to several tens. In autumn last year, the Competition Council allowed Agrokoncerno Grūdai to purchase two large grain elevators from Rokiškio Grūdai and Kretingos Grūdai. The elevator takeover scheme is similar to that of the agriculture companies. For example – Rokiškio Grūdai, whose elevator was purchased by Agrokoncerno Grūdai last year. Prior to privatising the elevator, "Farmer" Algimantas Čenkus was the company's commerce director. Immediately after the Competition Council allowed Agrokoncerno Grūdai to purchase the elevator from Rokiškio Grūdai, A. Čenkus received benefits – he was elected the LVŽS' Rokiškis branch chairman. The LRT Investigation Department journalists were able to confirm first hand that it is not the Ministry of Agriculture that is in charge of Jonavos Grūdai. It would appear that Jonavos Grūdai is mired in confusion over whom it belongs to and whom it is accountable to. The company's leadership assures they are private individuals, who are not required to provide journalists any information. Even if Jonavos Grūdai is not only a state owned enterprise, but also a company of strategic significance, which is recognised as a state importance object. Initially the director general of Jonavos Grūdai Paulius Kaselis refused to give an interview, stating he has no time to interact with journalists, thus he would only respond in writing. However, he was reluctant to provide information even thus. The same questions were presented to the Ministry of Agriculture, however Jonavos Grūdai delayed providing it answers as well. Even if the enterprise is accountable to the ministry. Upon travelling to Jonava, further surprises awaited. The journalists were not allowed into the state owned enterprise and the Jonavos Grūdai Commerce and Innovation Department head Mantas Butas barred the way. He explained that the journalists cannot come to the company without special agreement, apparently, all the employees at the company are private individuals, not public figures, thus they cannot be filmed, otherwise matters would go to court. With the journalists departing, the LRT Investigation Department received angry letters from the Jonavos Grūdai management. In the letters, M. Butas accused the journalists of ethics breaches and assured that "the civic interest to receive information is fully satisfied" because all the information the journalists need to know is presented on the company's website. Director General P. Kaselis assured in letters that Jonavos Grūdai "is neither a state, nor a municipal company or institution," and thus was not required to disclose information. While arranging interviews is not a minister's job, G. Surplys and the Jonavos Grūdai board chairman, a Ministry of Agriculture representative had to get involved. Only then did the management of Jonavos Grūdai agree to answer questions.